Yummy, fantabulous, creamy proteiny goodness! The Bariatric Foodie has updated her blog with some great ways to spruce up the high protein, yet dreaded cottage cheese. I, for one, love cottage cheese, but I can understand the loathing part for some people as it is not a smooth and creamy treat. I love it nonetheless and wanted to share some of Nikki's ideas with all of you. 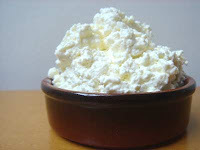 Head on over to Bariatric Foodie and check out the tips, tricks and recipes for her take on cottage cheese. She has some great stuff on there for "micro-eaters"! Check out and let me know what you think!